I have two photos of me from my five or so childhood years in Shanghai. 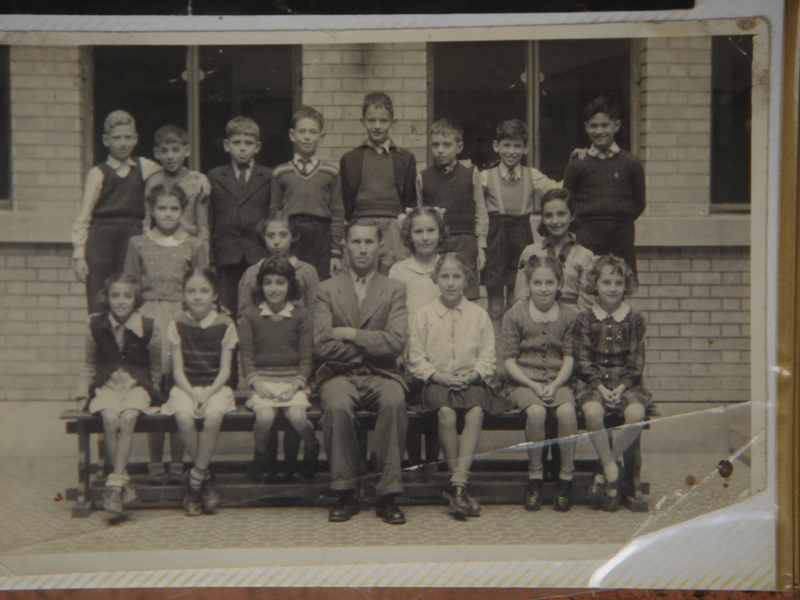 The earliest one is a photo of my class at the Shanghai Jewish School, from some time in 1945 or ’46. I’m the fourth boy from the left in the back row. And here’s a 300% enlargement of a crop from that photo which may give a better picture of what I looked like that day. On the verso of the photo are the names I wrote then of those of my classmates who were present the day the photo was taken. Unfortunately I wrote the initials only of the given names, of which I remember only one, that of the boy on the right, Dicky Razon, who lived not far from where I did. But there were classmates who must have been absent on the day the photo was taken. I know this from autographs other classmates wrote in the autograph book I still have from my last months at this school, which I’ll write about towards the end of this page. There you had to get off & walk across the road to catch another trolley & buy another ticket for the remainder of the ride. The school, which was on that road (the green rectangle in the top left corner), was a formidable building, though not as magnificent as Ohel Rachel, the great Sephardi synagogue beside it. Earlier during the war the Japanese had closed the school and synagogue for some time and taken over the buildings over for to use as headquarters and barracks, as they had also done with the Cathay Theatre on the corner of Avenue Joffre and Rue de Cardinal Mercier, but now they had returned the complex to its previous owners. When I started going there, there were still signs of damage their occupation had done to the buildings, but reconstruction was already in progress. I don’t remember what we studied. The anecdote I told above is my only actual memory. There must have been the usual combination of lessons, English, maths, probably history & geography & Hebrew & bible stories. I don’t remember any sport or art activities. Anyhow, I did pretty well as a student there, won second prize in the class one year & was awarded a book, Tom Sawyer Abroad, which I still have with me, but never enjoyed as much as the first Tom Sawyer & certainly not as much as Huckleberry Finn. 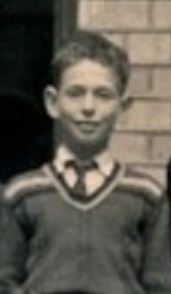 As my phrasing on the verso of the class photo suggests, I got along OK with most of the other pupils in my class, but had no particular close friend or friends I played or did things with; in fact I was very much a loner (already!) in those years, after my break-up with Joboy & Jessie, which I remember grieving over for a long time. I also clearly remember that it was simultaneous with my break-away from Christianity but today I no longer remember why: I don’t know if my parents forbade me to see them again, or if I went to the back fence once more & told Joboy that I was a Jew &/or if that led to his parents forbidding him & his sisters to see me, or if he got angry at me & thought that I’d been lying to him all this time, pretending to be a Catholic (at this point in time I don’t even know myself if that’s what I’d been doing all that time). Anyhow, we didn’t see each other at all any more for a long time, a year, perhaps two, & though we became friends again, it wasn’t quite the same. But I had my own interests – I read a lot, I followed the progress of the war, listening to the news in Russian, which I understood very well by then (as I’ve mentioned briefly in Tatuś, tatusiu: (What I called my Dad in Polish…); on weekends & holidays I would sometimes go to the Soviet Youth Club & later also to Betar, which I either heard about in school or was told about some friend of my parents; & then the war in Europe ended, & a few months later the war with Japan ended, & the American soldiers arrived, & a whole new & exciting era began for me (I’m planning to write about these things in the next pages of my memoirings). 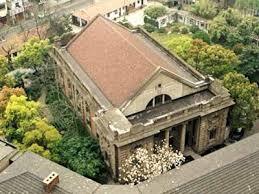 At a certain point it began becoming clearer that the Communist forces would take Shanghai within the year. The American forces would not stay to fight them, and without them it was not likely that the Chiang Kai-shek’s Chungking forces would fight to try to keep Shanghai. What this meant for all “Europeans” living there was that they would have to leave Shanghai soon. In about mid-October, autograph books started appearing at school. The first ones to bring them were the kids that were leaving soon. My class-mates David Blanker, Harry Klajman and Daniel Kriesberg (none of whom are in the photo) were all going to New York, and asked me to write messages of farewell in their autograph book. I wrote that I was very sad that we were separating and very happy for them that they were going to New York, and very jealous too (by then I had formed a picture of America as the best place in the world for a kid to live in). And I asked my mother to bring me an autograph book from the American PX where she had managed to get a job. 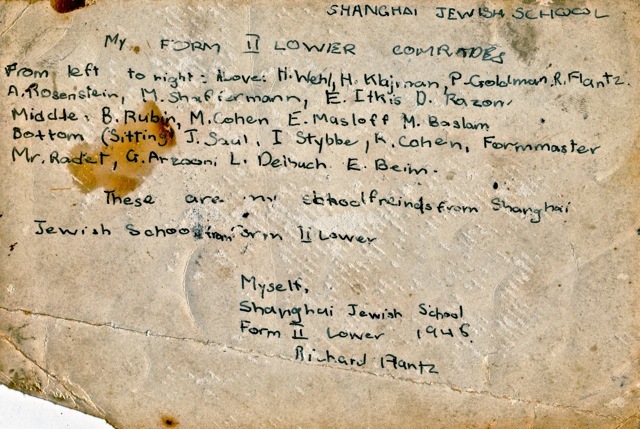 Even though we weren’t leaving yet, & didn’t yet have a permit to go to any other country, I wanted some of those who were already leaving to write messages in my own book – Joboy had already told me that at the end of November the San Lazaro family would be leaving their mansion and garden and the city of Shanghai for ever – and I also wanted to start collecting autographs early, because we would be leaving some time too. When I got it, I wrote on the pink page stuck to the front cover: “NOTICE / To write in my album / My friends I invite/ But to tear out pages/ I call impolite”, and on the facing pink page, in a handwritten scrawl: “This Autograph belongs/ to R. Flantz/ Recieved on 24/10/45/ Shanghai”). David wrote: “Farewell, Dear Richard”, and quoted: “Here’s a sigh to those who love me/ And a smile to those who hate/ And, whatever’s sky above me,/ Here’s a heart for every fate. your David. D. Blanker/ Shanghai. ch. Latter address : 71 Hig Street N.Y.” Harry wrote “Forget M/ Forget E/ But remember me”, and signed. 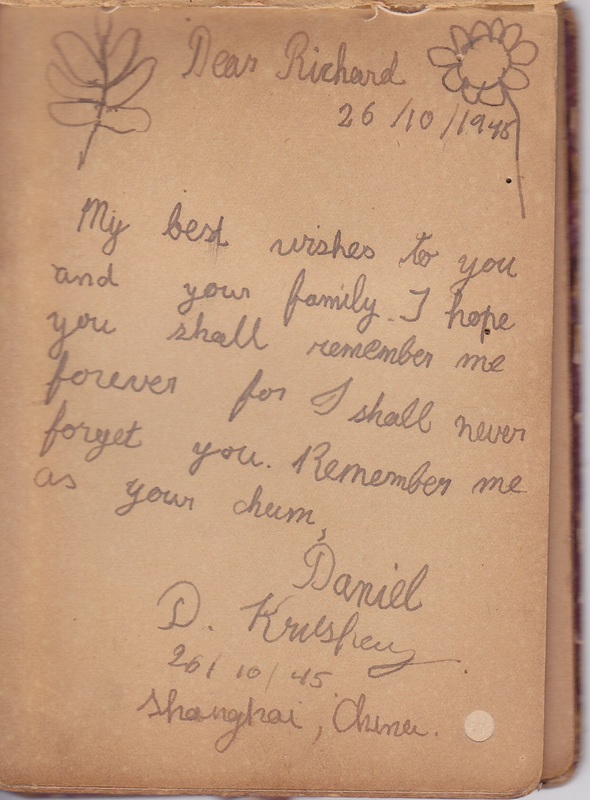 And Daniel wrote: “Dear Richard – 26/10/1945” with a drawing of a sunflower on the right and of a seven-petalled leaf on the left of that, and then “My best wishes to you and your family. I hope you shall remember me forever for I shall never forget you. Remember me as your chum, Daniel”. Another friend, also not in the photo, the girl who – according to a memoiring I wrote many years ago – I shared a desk with in class, and felt much affection for, wrote: “North South / East West / Of all my friends / I love you best // From your best friend Zaia Hania”. I don’t know if any of them remember me, but I have to admit I don’t remember any of them, what they looked like, how close we were, nothing. The faces in the class photograph do arouse feelings of recognition, I seem to remember, yes, that was someone I was in school with. I also seem to remember that for some of the time I had a secret crush on a girl called Lily (quite possibly the second from the right in the front row).